Altogether there are 2,300 Visual Effects shots in the movie. ILM worked on 670 shots for the movie. Jeff White lead as VFX supervisor at ILM. Rodeo FX worked on 2 key sequences both of which are heavily featured in trailers for the film. A creative team of 120 crew at Rodeo FX worked for the movie. President, Sebastien Moreau lead as VFX Supervisor for the movie. For the vibrant aquarium that young Arthur Curry visits at the beginning of the film, Rodeo team made an intricate slice of ocean life look realistically varied and unpredictable using a large volume of simulations as well as algorithms for the fish behavior. They created hard and soft corals by developing a colonization growth system, along with procedural stem and tentacle generation tools to capture all the unique and complex details that would be seen on a real coral system. They also created the environments for the Atlantis ruins below the desert. Artists used a lego-type approach to layer the environment with a large amount of sand, dust and rocks, all of which would realistically give way to the characters’ interactions. From there, they sculpted ruined buildings, bridges, towers, statues and temples, which textured and shaded to add depth to the ruined city. Method Studios created two of the movie’s key sequences – the pursuit of Arthur and Mera (Amber Heard) through a Sicilian seaside village and an underwater journey into the Well of Souls. 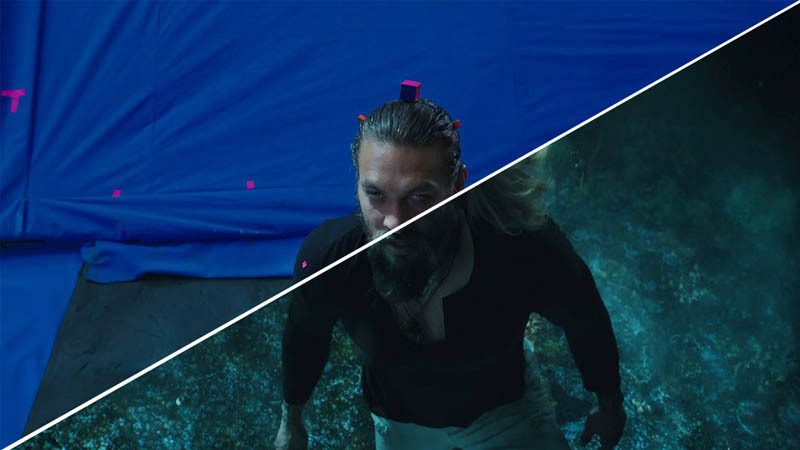 Filmed dry-for-wet, Momoa was captured on set in rigs that simulated underwater movements but ultimately felt restrictive; Method artists replaced the majority of his performance and added the CG environment, Karathen and Arthur’s free-flowing locks, which feature an undone aesthetic that served as the guideline for how his hair should look throughout the film. Method artists also crafted a psychedelic 700-frame shot dubbed by Wan as ‘The Quickening,’ for which they were given loose direction to create a journey through Arthur’s mind’s eye. Scanline VFX worked on 450 shots for the movie. Bryan Hirota lead as VFX Supervisor.